We like to ask ‘why’? I like to ask ‘why’? And then I read about Joseph’s trials in Genesis and the answer is pretty clear. 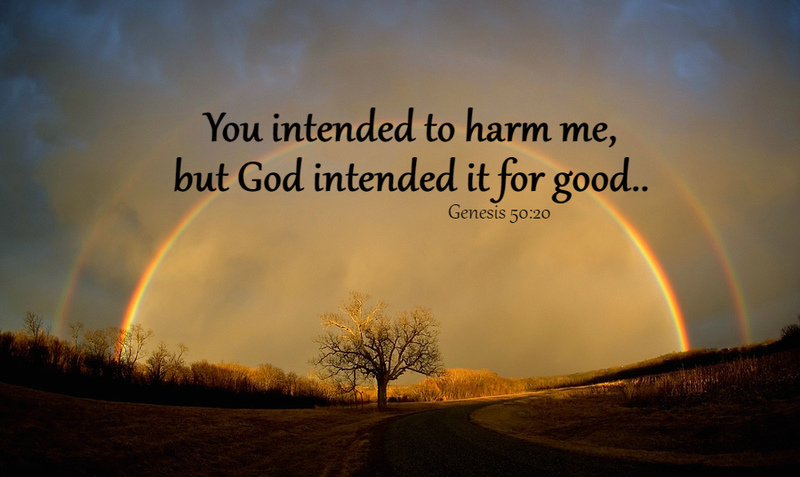 A long list of bad things happened to Joseph and God worked to bring good out of those bad things. Joseph’s faith and wisdom grew as he trusted God through it all. I don’t believe that God caused all of these bad things to happen to Joseph or to you and me. Some of them happened because we live in a world where we all sin. We pay the consequences for our sins as well as other people’s sins. And Satan is working relentlessly to entice people to sin. He is creating a lot of our trials. I don’t understand why some people get mad at God when bad things happen – they should get mad Satan who is doing the dirty work. Yes, God is in total control so he could stop them. But we choose to sin. Other people choose to sin. There are consequences for that sin. When we get to where we’re going (heaven) we will no longer sin and there will be no more consequences. Here on earth – when God is with us like he was with Joseph – he can use these consequences so that something good comes from them. This truth makes the account of Joseph’s life very important to me. His brothers sold him into slavery but – wait. Then he’s put in charge of the top Egyptian official’s house. The official’s wife lies to get Joseph in trouble and Joseph is thrown in jail. But – wait. God was with him and he was put in charge of the prison. Joseph helped the Butler and Baker get out of prison – good news for the Butler, bad news for the Baker. The Butler forgot about Joseph for 2 years until Pharoah had a dream and Joseph was called out of prison to interpret it. Pharoah was so impressed that he made Joseph 2d in command, right under Pharoah. From that position, Joseph was responsible for saving the lives of a whole nation. A serious famine was coming and God spoke a warning through Joseph’s interpretation of Pharoah’s dream. God was with Joseph through all of the bad things that happened to him, making sure that he ended up exactly where he needed to be in order to fulfill his destiny. Joseph also saved the lives of his brothers who sold him into slavery. This indicates the level of maturity and faith Joseph had acquired through his trials. What the brothers had done was evil, but God used it for good purposes. Joseph’s story is a great one to read when I’m wondering how God will use the recent tragedy in my life. Joseph could never have predicted the part he was going to play in the huge famine that was coming. God knew. And he was with Joseph every step of the way. Just like he is with me as I go through my trials. Just like he is with you when you experience trials.